Slowly we're eating more and more fish. Not often, but way more than never. I saw this glaze over at Karen's Back Road Journal and it looked so good, I had to try. Together with the broccoli slaw it was one fantastic dinner. We really enjoyed it. Miss Picky had chicken with the glaze. The fish stuck a little to the grill so next time I think I will take a cue from Judy at a Tasty Thought and get one of those grill pans for the grill. 2 tablespoons sweet chili sauce. Heat the sesame oil and the garlic over medium heat and sauté for about a minute but do not let the garlic burn. Add the rest of the ingredients. Simmer for two to three minutes to combine flavors. Remove the glaze from the heat and set aside. Place the salmon skin side down on a hot grill, for about five minutes or more depending on the thickness of the fish. Use a fish spatula to carefully turn the fish to cook the other side, another 5 minutes or more, depending how you like your fish cooked. Remove skin, drizzle with glaze and serve with Broccoli Slaw and lime wedges. Empty a bag of broccoli slaw into a bowl. Add most of the peanuts, reserve some for garnish. Pour the dressing over the slaw and mix well. Refrigerate for about 30 minutes for the flavors to mix. Remove from fridge and toss with the reserved chopped peanuts. Garnish with chopped cilantro and sliced green onions, if desired. Beth at Beth Fish Reads for her fun Weekend Cooking Party. Every weekend. It's open to anyone who has any kind of food-related post to share! 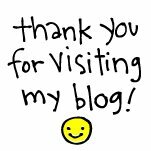 Go on over and see some fun posts. Could this be the salmon recipe I've been searching for? We eat a fair amount of salmon and I'm always looking for a new way to serve it - this one seems to hit all my favourites. I don't think we can buy broccoli slaw here. I'll have to google it. I am drooling, I want to try that pad Thai dressing! The dressing sounds delicious! Lovely recipe!Have a great weekend,dear Carol! Looks delicious, especially the broccoli slaw! Both the salmon and slaw look delicious! Happy St. Patrick's Day! Both dishes look delicious! Trying to like fish more and this just might help. We all love salmon and we all love combining with Asian flavors! So this one is certainly a keeper Carol! I am sure my son will be thrilled with this! thank you for these recipes!!! perfect for Fridays in Lent...although maybe just too good for Lent! thanks!! Gorgeous, Carol! Have a wonderful weekend! I saw that post too and thought it looked delicious! We always use the flat side of a large, cast iron, griddle to make salmon on the grill. It works perfectly! Beautiful salmon dish, Carol. I love that glaze! The broccoli slaw is what's holding my interest though. My recipe is not a Thai version and I really like your recipe; never have added peanuts, either. I think my old recipe needs some updating! Happy St. Paddy's Day, dear friend! The salmon glaze looks and sounds delicious. They have bags of broccoli slaw at the market I shop at as well as a large Asian selection of products. I am bookmarking this one. My mouth is watering. What a beautiful presentation; we love salmon. This has to go on My Must make Board; thank you. Really - this looks CRAZY GOOD!!! These are really healthy foods in here to that I am trying to get the extended fam to eat. So, I am for sure making these... I like your blue bowls and over-all presentation. Rita (above) is right. Very pin-worthy! thumbs up on the broc slaw too! and with the cilantro without question. Loving the broccoli slaw *except* for the cilantro! I would like to get more fish in my diet, and this one looks great;; love the photos! Oh my goodness, this looks SO good! I've been trying quite a few new fish/seafood recipes lately. I'm going to bookmark this post. Thanks! We don't eat anywhere enough fish. This recipe looks delicious. I don't think we have bags of prepared Broccoli Slaw but it would be good with stir fried green vegies or salad too. Those both sound terrific and perfect together! MMmm, I love salmon and broccoli. Your pictures make it look really, really good. My Weekend cooking post is here. I love broccoli slaw! I'll have to play with the recipe to remove the peanuts, but I think I have some good substitutes. I am having a friend over for dinner one of these Sundays and he is a real salmon lover. This should be quite nice to serve that evening. Thanks for a great recipe. Yum! And I'm happy to say I finally learned to come visit when my tummy is full! Have a great week! This meal looks amazing and delicious! I am going to bookmark and definitely try the slaw and dressing, yummy. You've just made me hungry. 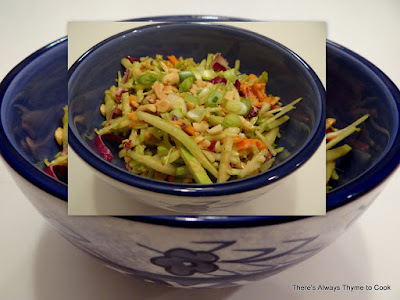 I love the thought of that dressing on the crispy, crunchy slaw--what a perfect pairing for the fish. Thanks for sharing it with Souper Sundays. You always post the most intriguing recipes AND they are always pretty. This looks like wonderful flavor combinations, Carol! I have to clean my grill and start cooking outdoors again if the weather stays nice. 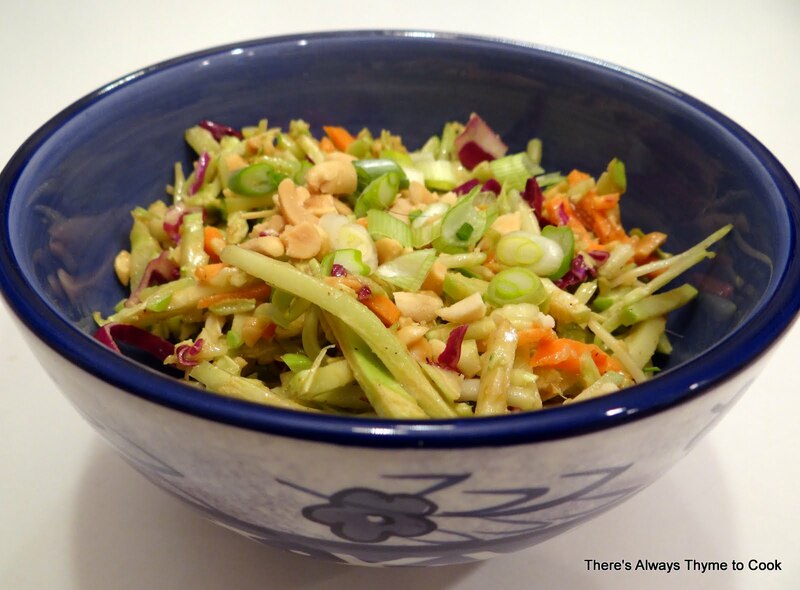 Prepared broccoli slaw is a real time saver, and the dressing sounds divine! That looks and sounds fabulous. Thank for sharing that with us. I am going to try it tonight. What a healthy delicious meal! I love the sound of that glaze...I'd be putting it all over everything. thanks for the reminder of this meal--or something similar. You know how we forget recipes that we love? And I like your mosaic! Have a good week. There are days I'd like to move into your house! Yum. This looks really lovely - I've been meaning to cook more fish so this is really perfect - great meal! What a lovely meal. It's a different and interesting use of broccoli as well. I am in love with your broccoli slaw - I love the pad thai twist. Plus I think your salmon looks delicious. Unfortunately the husband hates salmon (and fish in general) but I do make him eat fish once a week so I feel your pain as far as trying to incorporate more fish into your weekly diet. What a beautiful glaze!! Love grilled salmon and that looks absolutely delicious!!! Looks like it would be something from the menu of a nice restaurant! Okay now I may just have to make this asap! I adore this recipe! We make a orange marmalade version but I absolutely lOVE the idea of substituting our jelly sweetness with hoisin and peanut sauce. This will surely become a family favorite! Your salmon looks amazing! I'd love to try it out. 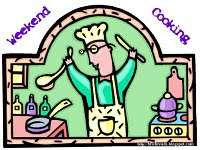 Thanks for linking in to my Food on Friday - see you at the next Weekend Cooking with Beth! I must try! The glaze looks amazing. Yum, veggies are the way to go too!